Danny Welbeck will miss Saturday’s FA Cup final after failing to recovery from a knee injury, manager Arsene Wenger has confirmed. Welbeck has been battling hamstring and knee problems for some time and has not started for Arsenal since the FA Cup semi-final win over Reading. He had hoped to be available for Saturday’s Wembley showdown against Aston Villa, but Wenger has confirmed he will miss the final and England’s games against the Republic of Ireland and Slovenia. “Danny Welbeck will not be fit for Arsenal or for England,” Wenger told his pre-match press conference. “That’s the only injury we have at the moment. “He would have been short anyway. I was prepared for that because he didn’t train until Friday so I knew he wouldn’t be ready for the FA Cup. 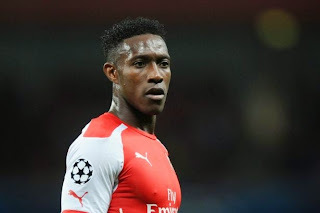 “When I saw Roy Hodgson he was confident and I was that Welbeck would be available. but we called the FA and we explained to them that his bone bruising of the knee had not healed. Alex Oxlade-Chamberlain and Mathieu Debuchy are available for the game but may have to settle for a place on the bench.